Last night ON TV made a TV history when it hosted the first real political debate between a prime minister and opposition figures in Egypt. 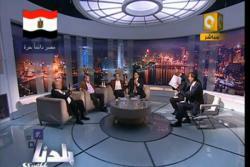 This episode started from 10 PM and ended at 2 AM Cairo local time. Originally this TV show was not intended to be like that. Earlier Wednesday we found an announcement on ON TV’s news bar that Reem Maged would host PM Ahmed Shafik along with Naguuib Sawiris, Amr Hamzawy and Dr. Kamel Abu El-Maged and after that Yosri Fouda would host Hamdi Kandeel and Alaa Al Aswany in his show. It was from the start good preparation and programming because we all knew that whatever Shafik would say , Al Aswany and Kandeel would fire back afterwards. Reem’s show started and it was actually terrible one , a counter revolution episode in front of us and Amr Hamzawy who seemed to speak logically in front of the PM from my point of view was not given enough time to speak. Shafik defended the state security and considered its role as holy and this shows where we were going. Sawiris also was mad on how Ahmed Ezz , Garana and Maghabi were arrested despite he did not name them. As I described it , it was a counter revolution show to scare the people from the revolution thanks to Shafik and Sawiris. For an hour and half I felt so angry from Shafik and I was not alone actually because twitter and FB were full of angry comments as well. Then came the golden announcement on Yosri Fouda’s twitter : Al Aswani and Kandeel will join the PM afterwards in an open discussion and it was the announcement of something unprecedented in the Arab world. Al Aswany of course had to fire back and reminded him that it was from right as Egyptian citizen to ask. Now Al Aswany is being accused of rudeness in the Facebook and twitter also in several Egyptian websites for standing against the prime minister, of course those people who attacked Al Aswany have never seen a prime minister being really interrogated and roasted in a parliament before and actually they have not lost someone dear or lost any eye because of Mubarak’s regime !! With my respect Shafik insulted the martyrs at Tahrir more when he spoke about the garbage at Tahrir square that should be cleaned to justify his Hyde Park’s plan for the square. He insulted hundreds of martyrs and thousands of injured when he spoke arrogantly about how he wanted the army to distribute meals on the protesters of Al Tahrir !! He did not give a direct answer when he was asked on the contrary except once or twice , he was so irritated and seemed not to be opened for any real criticism. His body language was clear to all of us that he was nervous and not comfortable. Hamdy Kandeel was a pro , he is a veteran TV host who knew how to corner Shafik calmly and smoothly , a great smooth killer he was. Kandeel wondered about the minister of foreign affairs and the Egyptian candidate for the league of Arab states’ secretary position. I will not comment about Sawiris because actually he should have left and Amr Hamzawy stayed. Even in Lebanon where the prime minister mocked freely and explicitly in the comic show ,nothing like this happened before there and I am a person who watches Lebanese political shows very well. Now according to my sources after the show the men were so civilized , Shafik saluted Kandeel and Al Aswani twice before leaving. Shafik already was the one who requested that the two guests join him despite the warnings of Swairis. Again this episode was a TV history made in front of us. And PM Ahmed Shafik resigned in the morning !! In fact there are sources saying that AFC members saw the interview and took the decision at the same time. Already when I watched the interview again I found Shafik speaking about disagreement between him and council towards the ends of the show. another good report Z. cant wait to see the video with english subtitle so that those who dont understand Arabic could enjoy watching it too!!! good nite! "Now Al Aswany is being accused of rudeness in the Facebook and twitter also in several Egyptian websites for standing against the prime minister"
I do not agree, both to be accused of rudeness for their attitude in discussion. however in most of the conversation Aswany was worse than Shafik, he was aggressive and he was not listening to opposing opinions. that's why people started to accuse him, not for confronting the PM. Thanks for the blog ! I would like to know if there are any links for this historic episode ? That sounds amazing. Thank you for passing your information on via twitter and your blog. I hope enough good will can be found among opposing parties in Egypt to reach a consensus for the benefit of Egyptians. Egyptians have demonstrated so many great qualities in recent weeks. I hope you continue to amaze us in a positive way. Thank you for this post. As an Egyptian ExPat, this kind of information is valuable and makes me feel connected. This is glorious!!! I am soooo happy for the nation of Egypt!!! I have read your posts and you have been my private guide to these world changing events! Thank you! Yes, it was an incredible show, beyond imagination. To think that after watching the first part, on Baladna bil Masry, I was so bored and frustrated that I almost turned off the tv and went to bed! Then they announced that Qandil and Aswany would be on with Shafiq and everything changed. Alaa Aswany showed himself to be a true man of conscience, determined to accurately and boldly represent the revolution. Sawiris represented the business elite viewpoint very well. Hamdy Qandil didn't speak much but when he did, like you said, he was "a great smooth killer". The biggest surprise was Ahmed Shafiq himself. For the first time, I realized that he is prime minister in name only; in fact, he is nothing more than a servant, with no decision-making power at all: not too bright, but still willing to shamelessly defend whatever his bosses decide to do and at the same time take no responsibility at all. How many times did he say, "I don't know" or "It's not up to me" or "We'll have to wait and see"? He was pathetic and at the same time contemptible: a noisy airbag put up as a front for those who actually do make the decisions but who stay out of the light. Some of those decisions, like keeping Mubarak-linked individuals in critical ministries like interior, foreign affairs, petroleum and justice, not to mention defense, ensure that the changes caused by the revolution remain purely cosmetic and especially that they do not adversely affect foreign interests, namely those of Mubarak's US and Israeli allies. If, as Shafiq strongly implied, he is not the one with the power to decide such things, then it's not Shafiq who should be on the hot-seat facing the hard questions and being held accountable for his words and deeds, but our new mysterious Master or Masters. There's been a revolution, you know. Great analysis and commentary on the political "debate" :-) Your blog here is now featured as a link on The Guardian's website (which is how I found it). The one great thing about democracies, is that politicians must face the people, and answer questions, and if they can not - or will not - answer them, then the people can throw them out at the next election. Democracy is not perfect (obviously), but as Winston Churchill said, "Democracy is the worst form of government except all the others that have been tried." Mabruk on Shafik's resignation! Hope you will get rid of Abu Algheit in the next gov. And now Shafik resigned. It was obvious from the debate that he would not be able to adjust to a political environment with free and open opposition. Maybe he realised that and his own obsolescence in aniticipation of tomorrow's protests. i agree in general bas, in my point of view, you are harsh with sawires. Some of his position on some points were discussable because of his "economic" biaisis" but in general he prooved that he is a liberal person, for a democratic egypt: wel dalil 3ala keda : howa saheb on tv. Thanks for the details. I'm slowly learning Arabic so it's nice to see the recap in English. It is a very good sign, that this show even happened. It was obviously unthinkable before. Something has changed in Egypt. So much has changed already. I am half Egyptian, but feeling very Egyptian these days. I wish Egypt all the freedom, freedom of speech, peace and joy in the world. Thanks for the rundown! I tried to watch some online from here (NYC), but since I had missed most of the beginning found it very hard to follow with all the interrupting right and left...Personally, I don't think it's just a big moment for Arab TV. Although our leaders in the U.S. will go on TV to debate one another, I don't think we have seen or will see a set-up like the one on ON TV anytime soon. Please correct me if I'm wrong, I would certainly love to see it! But generally I don't think any TV hosts would be willing to bring surprise guests on TV with the President or Vice President, and even the lower-level but still very powerful people don't really open themselves to this sort of criticism and confrontation. I found it amazing to watch the bit that I did see & I was not thinking of Mubarak, I was thinking "Imagine if Bush or Obama had to go on a show like this...!" We have our press conferences and town hall meetings and so on, but I think the setting of a talk show like this is really high-pressure & something few savvy politicians would subject themselves to. I wonder whether this is just a blip or whether we can somehow make sure that, in future, our politicians and leaders *must* expose themselves to serious, sustained criticism in order to maintain legitimacy. I suspect it's the first, but hope for the second! As Luluw said, this needs to be made available with English subtitles. If anyone finds that, please post a link. Great! I sort of get lost among all these details of who said what and who is who, but it does not matter.... The best thing is, finally you can have open debates about policy in the Arab world, prime ministers and governments against the opposition. That's the way to go! Hope it works out for you and keep up the good works! Thanks a lot for the report. It's great to get a personal perspective on the headlines, and your blog post managed to give this glimpse into a reality, which made me feel that "Aha, NOW I understand a little more about what is ACTUALLY going on." @Anonymous 3/03/2011 11:07:00 PM "And let's put an end to FGM and let's have a gay pride march through Tahrir Square." I applaud the way Alaa el Aswany spoke. He was not rude or "uncivil". He was putting an end to the "doublespeak" in the media about the old regime. Bravo! I salute him in his sincerity to expose the hypocrisy of the old regime and bring to public attention their real intentions.a great moment for democracy and transparency in the new Egypt . I would like to salute this amazing blog as it really describes what happened during the past days. I am Egyptian and I was so proud of what happened but unfortunately some people started to attack Dr/Alaa very aggressively especially on Facebook which almost made me about to commit suicide as these people DO NOT UNDERSTAND what really happened in Egypt and do not understand its greatness throughout history . I even tried to talk to some of them which was my life mistake as I was insulted as well as Dr/Alaa . What I can say is that they are IMMUNE to change. Anyway I am so glad to see that there are true persons with crystal clear thinking like you .Thank you again. every one saw mr Shafik saying I have killed and was killed, under stood that he was reffering to his roll in the 1973 war as a fighter pilot, the truth which every pilot in the airforce at that time knows that he stayed on the ground till the war was over, he may say he was following Mubaraks order that the leaders of the air brigades do not take part in actual fighting, the order that was not obeyed by many of his colleges who led their pilots into battles as it should be???? Anyone knows where i can see this debate with english subtitles?